Aims: In this study, we discuss and analyse the association between bone mineral density (BMD) and intestinal probiotics of patients with type 2 diabetes (T2D) in order to illustrate the possible effect of lactobacillus and Bifidobacterium in patients with diabetic osteoporosis. Methods: 43 patients with type 2 diabetes melitus were chosen, and their general information was recorded, including BMD. Lactobacillus, bifidobacterium and serum inflammatory factor were detected by PCR and western-blotting analysis respectively and the pearson correlation analysis was used. Results: Results showed that there was a positive correlation between the amount of Lactobacillus and Bifidobacterium and BMD. The level of TNF-α, hs-CRP was significantly improved in PBMCs of patients with diabetic osteoporosis compared diabetes patients without osteoporosis. However, MCP-1 didn’t have significant difference between these two groups. Conclusions: Positive significant correlation between BMD and the amount of lactobacillus and bifidobacterium was found in this study. Besides, TNF-α, hs-CRP are significantly elevated in patients with diabetic osteoporosis. Those conclusions may provide a new therapeutic view on treatment of osteoporosis in patients with T2D in the future. BMD, Probiotics, Type 2 diabetes, Osteoporosis, Inflammation. Gut microbiota has become more important to several clinical conditions because its compositions could interact with host metabolism nowadays . Probiotic, a group of gut microbiomes associated with beneficial effects of humans and animals, may be helpful for metabolism management of patients with metabolic diseases such as type 2 diabetes (T2D)and osteoporosis (OP) which are classic and chronic metabolic diseases always strike in middle aged and old people [2,3]. In previous studies, probiotics were showed may become a new treatment material for T2D and bone mass density (BMD) could also benefit from probiotics supplementation [4-6]. However, the relationship between probiotics and BMD is still in its fancy for patients with type 2 diabetes. Insulin resistance (IR) is a pathological condition in which cells fail to respond to the normal actions of the hormone insulin and become a main pathogenesis for T2D [7,8]. Many inflammatory cytokines may start the process of IR as activated factors especially MCP-1, TNF-α and hs-CRP may play a significant role in IR. Among them, monocyte chemoattractant protein-1(MCP-1, also known as CCL2) as a potent chemokine secreted by adipocytes plays a pivotal role in insulin resistance which may affect BMD [9,10]. Tumour necrosis factor α (TNFα) as an inflammatory cytokine involved in impairing the protective effect of insulin and promote OP by mediating the advanced progression of OP seen in T2D. High-sensitivity c-reactive protein (hs-CRP) is an acute-phase protein found in blood plasma, whose levels to rise in response to inflammation and may also involve in insulin resistance [12,13]. Up to date, whether probiotics have a relationship among those inflammatory cytokines related to insulin resistance during T2D is still unknown. Thus, in this study, we will explore the association between probiotics especially lactobacillus and bifidobacteriums and BMD in 43 patients with type 2 diabetes in our hospital and detect the change in value of MCP-1, TNF-α and hs-CRP related to insulin resistance in order to show their relationship with probiotics. Hopefully, this study could provide a new therapeutic view on treatment of T2Dosteoporosisin the future. 43 patients with T2D were recruited from June 2014 to January 2015 in Shantou Hospital of Traditional Chinese medicine affiliated Traditional Chinese Medicine University Of Guang zhou, in which 23 male patients and 20 female at the age of 40-71 years old were included. All the patients had no liver and kidney function damage, acute and chronic infection, fracture or osteopathy etc., and all the patients were without medicine history of glucocorticoid within at least half a year. Type 2 diabetic patients were identified according to WHO diabetes sub-type criteria, excluding gestational diabetes, type 1 diabetes, or (and) other special type diabetes or high blood sugar disease . The basic information of patients was recorded in advance include gender, age (Y), weight (Kg), height (CM), Body Mass Index (BMI), glycosylated haemoglobin (%) of patients (Table 1). And all the patients were divided into controlled group (21 cases) and osteoporosis group (22 cases) according to the results of BMD. The research was approved by the medical ethics committee in our hospital, and all the patients agreed and signed the informed consent. Table 1. Comparison of general information of the two groups. Faecal samples were collected in sterile containers from all those patients and they were transported on ice and stored at −70°C prior to processing immediately. DNA was extracted from each faecal sample by the commercial kits according to manufacturer's instructions. Briefly, genomic DNA was extracted using the QIA symphony Virus/Bacteria Midi (kit QS) Kit incorporated an “off-board lysis” steps using 750 μl lysis buffer from ZR Faecal DNA MiniPrep™ kit (kit Z) combined with mechanical cell lysis. The lysate was centrifuged at 10000 rpm for1 min, and 300 μl of the resulting clarified supernatant was used for the DNA extraction on the QIA symphony® SP instrument (Qiagen, Hombrechtikon, Switzerland) as recommended by the manufacturer. Homogenisation of faecal samples, in Buffer ASL, for kit QA was performed using the Tissue Lyser LT™ (Qiagen, FRITSCH GmbH, Idar-Oberstein, Germany) at 50 Hz for 1 min. All extracted DNA was eluted in 50 μl of distilled water (H2O), except the automated kit QS, where the minimum elution volume allowed by the supplier was set at 60 μl using Buffer AVE.
Genomic DNA was treated using SEQr Bisulfite Conversion Kit from Applied Bio-Systems, following the manufacturer's protocol. Quantification of lactobacillus and bifidobacterium, using specific primer sets was performed on treated DNA to detect respective sequence. PCR was performed using the primers. (Lactobacillus: F: 5'- AGCAAGGATATGGAGAGTAGAAATACT-3', R: 5'- CGGTTTTTTGCTTGCTTGGATTA-TATTCA-3'; Bifidobacterium: F: 5'-CTCCTGGAAACGGGTGG-3', R: 5'- GGTGTTCTTCCCGATATCTACA-3') under standard conditions with an annealing temperature of 55.5 degrees Celsius . Each PCR was performed twice for each sample to ensure validity of results. Lactobacillus DNA, bifidobacterium DNA (both from GeneTex™) and water was used as both two groups respectively. PBMCs were obtained by centrifugation of whole blood (6 ml) through “Lymphoprep” solution (Axis-Shield) at 1800 rpm for 20 min at room temperature; lymphocyte–monocyte fraction was taken, washed twice with PBS and centrifuged at 1200 rpm for 10 min at room temperature. About 6 × 106 cells were recovered and subdivided in vials containing 3 × 106 cells which were kept in liquid nitrogen until further use. Total cell lysates of PBMCs (20 μg) were prepared in RIPA buffer (50 mM Tris–HCl at pH 7.4, 150 mM NaCl, 1% NP-40, 0.5% sodium deoxycholate, 0.1% SDS and 1 mM EDTA) and normalized for protein concentration. RIPA buffer was supplemented with protease inhibitor cocktail (Complete EDTA-free, Roche Applied Science). Protein extracts were resolved by SDS-PAGE, transferred onto Hybond-ECL nitrocellulose membranes (Amersham Biosciences) and probed with the following antibodies: anti-MCP-1 monoclonal antibody (Imgenex), anti-TNF-αantibody and anti-hs-CRP antibody (Santa Cruz). SPSS 19.0 statistical software was used to analyse the data, X ± S was used as measurement data, variance analysis was used of comparison among groups. K-S test and Pearson correlation coefficient were used of comparison among groups. p<0.05was present as significant difference. The general clinical data onto controlled group, osteoporosis group (including gender, age, weight and height) etc. have been shown in Table 1. There were 12 male patients, 9 female patients in controlled group. Another 11 male patients and 11 female patients in osteoporosis group. No statistical significance was found between age and weight of patients (p>0.05) both in controlled and osteoporosis group. Additionally, there was no significant difference of BMI both in controlled group and osteoporosis group (p>0.05). However, significant difference of BMD appeared in controlled group and osteoporosis group (p<0.05) (Table 1). Gray values of electrophoretic bands of both kinds of bacteria showed a significant difference in controlled groups and OP groups (p<0.05) as shown in Table 2. Besides, the amount of lactobacillus and bifidobacterium have a close relationship with BMD (Pearson correlation coefficient of lactobacillus is 0.785, p<0.01; Pearson correlation coefficient of bifidobacterium is 0.823, p<0.01), which means lactobacillus and bifidobacterium may have a change in values in T2D patients to affect their BMD as shown in Table 3. Note: The Table 2 showed the gray value of electrophoretic band between groups., the result means both control group and osteoporosis group had significant difference in the amount of lactobacillus and bifidobacterium. Note: Table 3 showed BMD and the amount of probiotic shad significant correlation in both control group and osteoporosis group. Table 3. Pearson correlation coefficient between amount of probiotics and BMD. 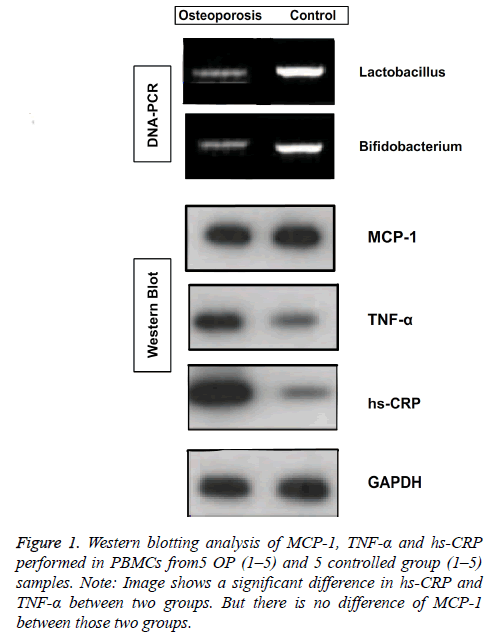 Western blotting analysis of MCP-1, TNF-α and hs-CRP performed in PBMCs from all those patients (Figure 1). Image shows a significant difference in hs-CRP and TNF-α between two groups. But there is no difference of MCP-1 between those two groups. Results of other samples also performed with the same as this. Diabetes is a group of metabolic diseases in which there are high blood sugar levels over a prolonged period. During the pathogenic process of diabetes, there are many complications affect organ and tissue functions of patients, especially the formation and functions of bones have become a key point for treating diabetic osteoporosis in recent years. Diabetic osteoporosis was a kind of systemic metabolic bone disease which was characterised by osteopenia, bone tissue microstructure damaged, bone fragility increasing and prone to fracture [16,17]. What’s more, diabetic peripheral vascular disease can lead to the distribution of blood vessels, bone tissue insufficiency and hypoxia, and abnormal bone metabolism, which can cause or promote the development of osteoporosis . And diabetic neuropathy can accelerate bone turnovers, improve the Increasing of bone mass loss, and lead to the occurrence of osteoporosis through the effect of local tissue on the nerve nutrition . Present studies have considered that the main reason was insulin deficiency which caused the reduction of BMD of patients with T2D and concurrent osteoporosis. When insulin secretion reduced and blood sugar was high, inhibition of glucose toxicity by insulin was reduced, following the differentiation and proliferation of bone cells, and subsequently leading to the osteoporosis . And the research of related treatment method would be carried out. Recently, a large number of cells experiments and animal experiments confirmed that probiotics have the ability to prevent and improve diabetes and metabolic syndrome . Besides, research trends in China and other countries proved that the probiotics (represented of lactic acid bacteria and Bacillus bifidus) can influence the lipid metabolism and related inflammatory factors, could influence the leptin level of T2D patients, promoting bone formation and maintaining normal bone mineral density . Our study also found that control group and osteoporosis group had significant difference in the amount of lactobacillus and bifidobacterium. Less lactobacillus and bifidobacterium may cause the decrease of BMD. We also deduce the relatively increase of bone resorption and decrease the function of bone formation may be caused by the increase of lactobacillus and bifidobacterium due to the changed quantity results of lactobacillus, bifidobacteriums and BMD. Besides, the increasing of intestinal lactic acid bacteria and bacillus of T2D patients may could reduce the level of inflammatory factor such as BMD and hs-CRP, and then resist the reducing of BMD of T2D, reduced the risk of osteoporosis. Due to the results of this study showed that inflammatory factors (BMD and hs-CRP) of T2D patients was significant changed in values by western blot analysis, which may lead to the reduction of BMD of T2D patients and increase the risk of osteoporosis of T2D patients. However, MCP-1 did not perform the obvious change in this study (Figure 1). Figure 1: Western blotting analysis of MCP-1, TNF-α and hs-CRP performed in PBMCs from5 OP (1–5) and 5 controlled group (1–5) samples. Note: Image shows a significant difference in hs-CRP and TNF-α between two groups. But there is no difference of MCP-1 between those two groups. In the context of the human genome project, the metabonomics and nutritional genomics developed quickly, and the scope and future prospects of probiotic as a natural food supplement and the biological treatment of drugs continues to expand. Therefore, during the treatment and prognosis of T2D patients, it was very important to pay attention to the change of intestinal lactic acid bacteria and bacillus of T2D patients, the change had important significance in maintaining normal level of BMD. It will be a kind of potential treatment strategy when probiotics were used in the treatment of diabetes and metabolism syndrome through gene engineering and polymerase chain reaction technology, taking the intestinal flora as the target . And we also hope this study could provide a new therapeutic view for treatment of T2D in the future. This work was supported by grants from Shantou Municipal Science and Technology Bureau, a prospective observational study of bone mineral density of patients with T2D mellitus, general science and technology projects, 2012/05-2015/05. Tonucci LB, Olbrich Dos Santos KM, Licursi de Oliveira L, Rocha Ribeiro SM, Duarte Martino HS. Clinical application of probiotics in type 2 diabetes mellitus: A randomized, double-blind, placebo-controlled study. 2015; Clin Nutr. Rijkers GT, de Vos WM, Brummer RJ, Morelli L, Corthier G, Marteau P. Health benefits and health claims of probiotics: bridging science and marketing. Br J Nutr 2011; 106: 1291-1296. Idzior-Walus B, Walus-Miarka M. Is now the time for probiotics in diabetes management? Pol Arch Med Wewn 2015; 125: 797-798. Qin J, Li Y, Cai Z, Li S, Zhu J, Zhang F, Liang S, Zhang W, Guan Y, Shen D, Peng Y, Zhang D, Jie Z, Wu W, Qin Y, Xue W, Li J, Han L, Lu D, Wu P, Dai Y, Sun X, Li Z, Tang A, Zhong S, Li X, Chen W, Xu R, Wang M, Feng Q, Gong M, Yu J, Zhang Y, Zhang M, Hansen T, Sanchez G, Raes J, Falony G, Okuda S, Almeida M, LeChatelier E, Renault P, Pons N, Batto JM, Zhang Z, Chen H, Yang R, Zheng W, Yang H, Wang J, Ehrlich SD, Nielsen R, Pedersen O, Kristiansen K. A metagenome-wide association study of gut microbiota in type 2 diabetes. Nature 2012; 490: 55-60. Karlsson F, Tremaroli V, Nielsen J, Backhed F. Assessing the human gut microbiota in metabolic diseases. Diabetes 2013; 62: 3341-3349. Parvaneh K, Jamaluddin R, Karimi G, Erfani R. Effect of probiotics supplementation on bone mineral content and bone mass density. Scientific World Journal 2014; 2014: 595962. Pauer J, Fek A, Buday B, Literati-Nagy B, Pach P, Vitai M, Peterfai E, Koranyi L. Metabolic alteration in healthy men with first degree type 2 diabetic relatives. Orv Hetil 2013; 154: 178-186. Chiu HK, Tsai EC, Juneja R, Stoever J, Brooks-Worrell B, Goel A, Palmer JP. Equivalent insulin resistance in latent autoimmune diabetes in adults (LADA) and type 2 diabetic patients. Diabetes Res Clin Pract 2007; 77: 237-244. Katakami N, Matsuhisa M, Kaneto H, Matsuoka TA, Imamura K, Ishibashi F, Kanda T, Kawai K, Osonoi T, Kashiwagi A, Kawamori R, Shimomura I, Yamasaki Y. Monocyte chemoattractant protein-1 (MCP-1) gene polymorphism as a potential risk factor for diabetic retinopathy in Japanese patients with type 2 diabetes. Diabetes Res Clin Pract 2010; 89: 9-12. Glowinska B, Urban M. Selected cytokines (Il-6, Il-8, Il-10, MCP-1, TNF-alpha) in children and adolescents with atherosclerosis risk factors: obesity, hypertension, diabetes. Wiad Lek 2003; 56: 109-116. Hamada D, Maynard R, Schott E, Drinkwater CJ, Ketz JP, Kates SL, Jonason JH, Hilton MJ, Zuscik MJ, Mooney RA. Insulin Suppresses TNF-dependent Early Osteoarthritic Changes Associated with Obesity and Type 2 Diabetes. Arthritis Rheumatol 2015. Talikoti P, Bobby Z, Hamide A. Hyperhomocysteinemia, Insulin Resistance and High HS- CRP Levels in Prehypertension. J Clin Diagn Res 2014; 8: CC07-09. Asemi Z, Esmaillzadeh A. DASH diet, insulin resistance, and serum hs-CRP in polycystic ovary syndrome: a randomized controlled clinical trial. Horm Metab Res 2015; 47 :232-238. Davies M. New diagnostic criteria for diabetes mellitus. Prevalence is reduced using these criteria rather than 1895 WHO criteria. BMJ 1999; 318: 532. Suzuki MT, Taylor LT, DeLong EF. Quantitative analysis of small-subunit rRNA genes in mixed microbial populations via 5'-nuclease assays. Appl Environ Microbiol 2000; 66: 4605-4614. Yaturu S, Humphrey S, Landry C, Jain SK. Decreased bone mineral density in men with metabolic syndrome alone and with type 2 diabetes. Med Sci Monit 2009; 15: CR5-9. Wallace IJ, Rubin CT, Lieberman DE. Osteoporosis. Evol Med Public Health 2015; 2015: 343. Kanazawa I, Yamaguchi T, Hayashi K, Takase H, Shimizu T, Sugimoto T. Effects of treatment with risedronate and alfacalcidol on progression of atherosclerosis in postmenopausal women with type 2 diabetes mellitus accompanied with osteoporosis. Am J Med Sci 2010; 339: 519-524. Chan L, Terashima T, Urabe H, Lin F, Kojima H. Pathogenesis of diabetic neuropathy: bad to the bone. Ann N Y Acad Sci 2011; 1240: 70-76. Isidro ML, Ruano B. Bone disease in diabetes. Curr Diabetes Rev 2010; 6: 144-155. Panwar H, Rashmi HM, Batish VK, Grover S. Probiotics as potential biotherapeutics in the management of type 2 diabetes-prospects and perspectives. Diabetes Metab Res Rev 2013; 29:103-112.